Find out how to build fast, keep pace with change, and tackle your toughest modernization challenges. Looking for efficient ways to future-proof your technology? Wondering how agencies like yours are benefiting from no-code development? 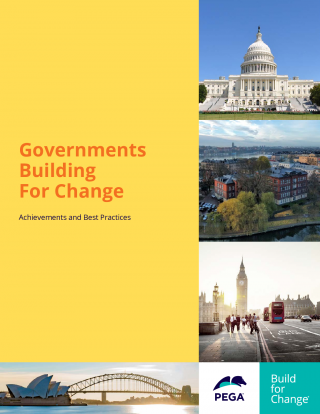 Read our eBook, Governments Building for Change, to hear about achievements and best practices of agencies across the globe, in sectors like healthcare and social programs, transportation, revenue and regulatory, and more. Pega fuses AI and automation, so you can think from your customer's point of view, build for an omni-channel world... and get value fast.